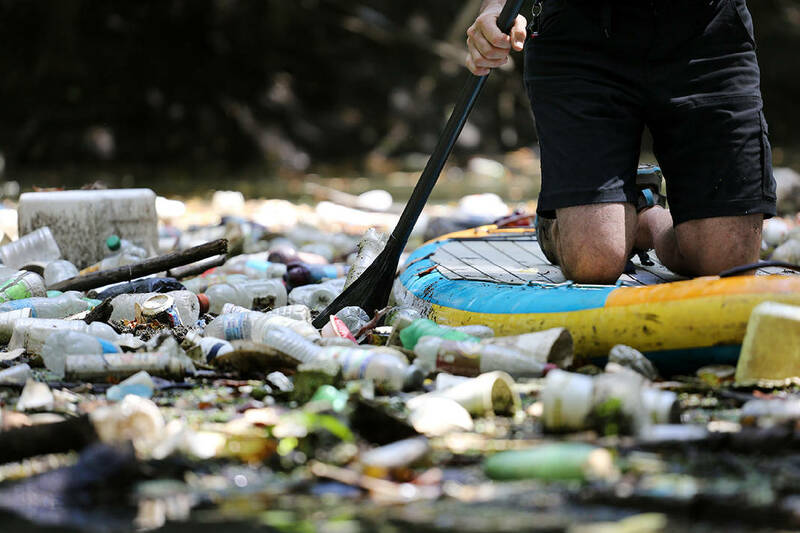 Staff photo by Erin O. Smith / Randy Whorton, director of Wild Trails, paddles through a section of Chattanooga Creek with a thick layer of trash covering the surface Wednesday, August 8, 2018 in Chattanooga, Tennessee. Single-use plastic, basketballs, shoes, tires and a 55-gallon drum are just a few of the items that littler the creek. 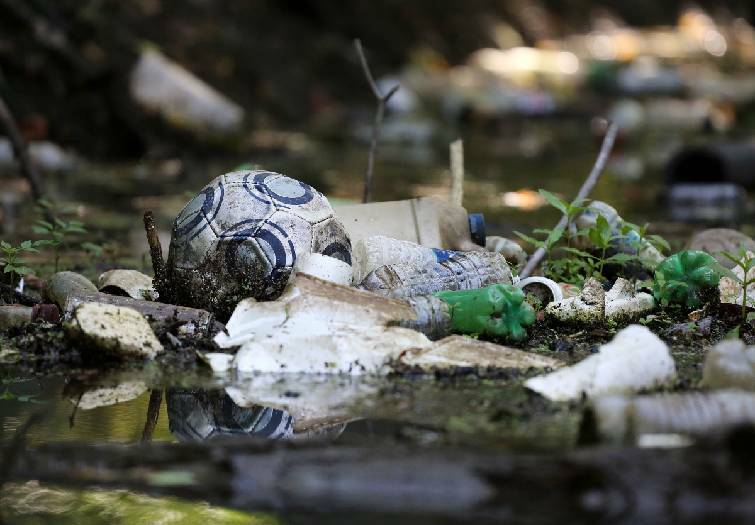 A soccer ball sits among other trash along Chattanooga Creek Wednesday, August 8, 2018 in Chattanooga, Tennessee. The creek was nearly impassible at a few spots where trash and debris had created a dam of sorts. Plastic grocery bags line miles of Chattanooga Creek, caught high in trees like vines clinging to the limbs along the creekside. The bags are what's left of floating waste caught on branches before the creek subsided. Past the pipelines, the overwhelming smell of human waste and piles of trash, where the water opens to a cleaner space, the bags remain — a constant reminder of the negative impact people are having on local waterways. "Unnatural art," joked paddler Randy Whorton. Through the creek in the heart of Chattanooga, downed trees act like dams in several areas, trapping single-use plastic, pollution and waste. Thousands of plastic bottles fill the creek alongside a menagerie of waste: a 55-gallon drum that once held automatic transmission fluid, shoes, basketballs, tires, Styrofoam, a shopping cart. There isn't a single source for the pollution: a person tossing a bottle from a passing car, remnants from several nearby homeless camps, trash collected in the city's stormwater system and dumped into the creek, and the litter blown and washed into the creek during storms. "This is the biggest problem in Chattanooga, as far as creeks are concerned, by far, in my opinion," Whorton said. "I paddle them all. I've never seen anything get this bad." Whorton is an avid outdoorsman. He runs, paddleboards, competed in the inaugural Ironman Chattanooga and is the director of local nonprofit Wild Trails, which is focused on promoting active living and the protection of open spaces. The long-distance paddler is preparing for a 300-mile trip for his favorite week of the year: SUP the State. Whorton paddles the creek at least twice a week. It's close to his home and is a convenient way to get in his early morning nine-mile trips. 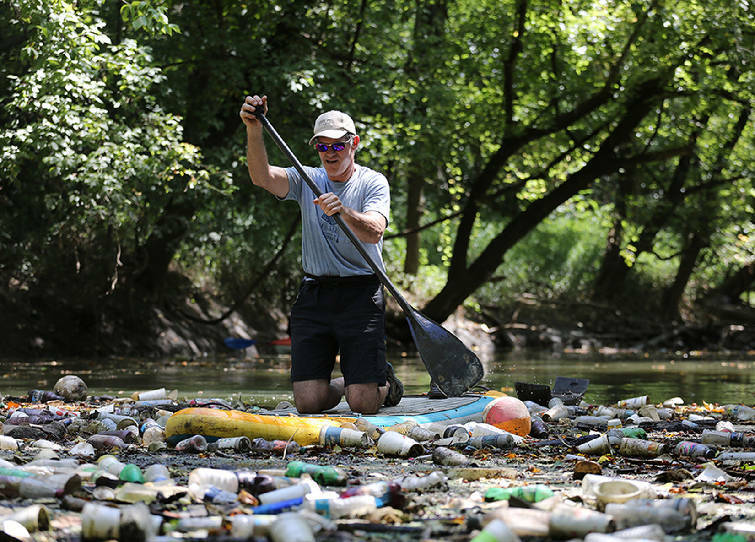 He's been paddling the creek for four years, carrying a wastebasket on his stand-up paddleboard to clean what he can, but the problem has grown. There are points that are nearly impassable due to the volume of waste. "On a surface level, our concern is all of the trash and the plastics in the creek itself," Tennessee Aquarium watershed educator Hayley Wise said. "A lot of that is single-use plastic. It's only used once and thrown away. In this case, it's been thrown into our creeks. The problem with that is it all flows down river. It's not just affecting this creek. It's affecting every creek that it's connected to and the rivers." Whorton is trying to fix the problem. He has been leading small, private cleanup trips this year and will lead a public tour Saturday morning to clear waste. Signs along Chattanooga Creek warn of the dangers within. "WARNING. THIS WATER IS CONTAMINATED. FISH UNSAFE FOR FOOD. NO SWIMMING OR WADING." The creek was a dumping ground for more than a dozen industries for at least a half century. The practice led to contaminated groundwater, sediment, soil and surface water, caused mostly when coal-tar waste was pumped into the creek from 1918 to 1987, according to the Environmental Protection Agency. The EPA fenced a section of the creek near Workman Road in 1993 to prevent public access and added about 2.5 miles of the creek to a list of the country's most polluted areas two years later. The designation on the Superfund program's National Priorities List in 1995 led to a five-year, $25 million federal cleanup that removed millions of pounds of coal tar from the creek by 2007. The EPA and Tennessee Department of Environment and Conservation have spent two decades cleaning the site, monitoring the water and trying to rehabilitate the ecosystem. TDEC also lists the creek on its 303d list of impaired streams — a list of water bodies polluted to the point that the public's reasonable uses are no longer maintained. The creek is monitored by the city's water quality team, which takes quarterly samples. While pollutants remain, there are signs cleanup efforts are making a difference. Fish, heron, turtles and other wildlife now call the creek home, an important step in identifying improved water quality. Staff photo by Erin O. Smith / Randy Whorton, director of Wild Trails, forces his way through a thick layer of trash in Chattanooga Creek Wednesday, August 8, 2018 in Chattanooga, Tennessee. The creek was nearly impassible at a few spots where trash and debris had created a dam of sorts. Environmental stewards are focused on minimizing plastic waste as a long-term solution to pollution. They warn the problem will continue unless there's a cultural change. Some U.S. cities are attempting to do just that. More than a dozen banned plastic straws, Seattle banned plastic utensils and some private companies are working to do away with plastic packaging altogether. "We need to start taking responsibility," Whorton said. Volunteers and public officials are left to deal with the current problem: Chattanooga creeks are filling with plastic. As a short-term solution, river and creek cleanup initiatives are expanding throughout the city. A class at the University of Tennessee at Chattanooga recently led a semester-long stream cleanup effort, and the Tennessee Aquarium will lead the 30th anniversary of the Tennessee River Rescue this fall — a community-wide cleanup day for the Tennessee River and its tributaries. "Tennessee River Rescue is an annual cleanup, but cleaning up once a year isn't the solution," Wise said. "That's where having these smaller cleanups are great, as well." Community members interested in Tennessee River Rescue are required to sign up for the October event in advance by calling 423-785-4024. The city's water quality team partners with the Scenic Cities Beautiful Commission to schedule and conduct quarterly stream cleanups. The organizations can provide garbage bags, gloves, a dumpster and supplies to help group cleanup efforts. The commission and the city will continue to facilitate community efforts through the year. To sign up a group for a clean-up or for more information call 423-643-6834 or email jeigelsbach@chattanooga.gov.